Over a century ago, somewhere in North America, people started making Sock Monkeys! 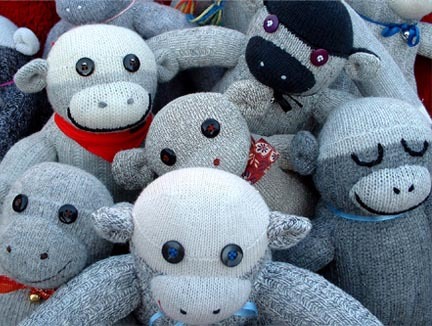 It’s impossible to say exactly where or when they began, but Sock Monkeys have been around since the late 1800's! During the Industrial revolution, mid-1800's, knitting machines to make socks were invented, and the first market for socks were labourers, lumberjacks, dock workers, the factory workers themselves! Prior to that, not everyone had socks! 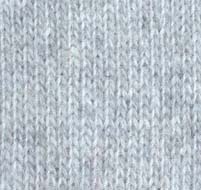 Grey wool worksocks were the first type of sock to become commercially available. At the same time, monkeys (real monkeys!) were super popular! By the finish of the century, clever people had figured out that a pair of socks could be made into a fantastic monkey! During the Depression, when toys were too expensive and fabric was hard to come by, Sock Monkeys were at the height of their popularity. Grandma would take a pair of Grandpas old work socks and make Grandbaby a Sock Monkey! Anyone, with a little imagination & a pair of socks, could make one, and each one was as unique as the creators and the children for whom they were intended. Some had button eyes, some had embroidery, some had outfits. Many were stuffed with old nylon stockings and during WWII, a few were even stuffed with newspaper! Over the years, other Animal patterns appeared, but the Monkey always remained the favourite. Sock Monkeys could be made out of any kind of socks, work socks being the favourite. In the 1930's, someone made a Sock Monkey out of a pair of Rockford Red Heel Socks and sent it to the company, Nelson Knitting Mills. The company thought it was brilliant and Nelson began including Sock Monkey instructions with every pair of Rockford Red Heel Socks they sold. The Rockford Red Heel Sock Monkey became very popular in the USA for the next few decades! As a note of interest, John Nelson patented the first sock knitting machines in 1869 and incorporated The Nelson Knitting Company, in Rockford Illinois, in 1880, which was the first company to manufacture socks world wide! The Red Heel Socks where first manufactured in 1890, and they were worn mainly by farmers and factory workers. Fox River Mills purchased Nelson Knitting Mills in 1992 and continues the great Sock Monkey tradition of including instructions with every pair of Red Heel Socks! Up here in Canada, in the 20's, 30's & 40's, we did not import Rockford Red Heel Socks, so folks would use heavy grey wool worksocks with red striped ends. Sometimes these were known as Lumberjack Socks, or Hockey Socks. (Sometimes the creators would embroider large red yarn mouths on them and those Monkeys were called Canadian Rockfords!) Because in Canada socks didn't come with instructions, the designs tended to be very diverse and individual, as their creators played with different Monkey ideas. 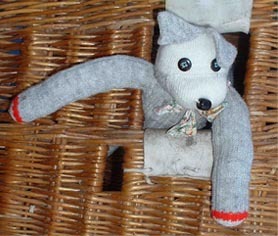 Canadian Sock Monkeys often had very long tails. Robin discovered Sock Monkeys a few years ago, when friends bought a pair of traditional Canadian Sock Monkeys at a Maple Sugar Festival, and Robin was inspired to create one for herself. She made Lumpy, a Sock Dog, from a pair of Canadian Tire Work Socks and she found the joy of making toys from Socks! Quite a number of folks still make Sock Monkeys, and Robin even teaches Sock Monkey Workshops, where you can make your own Monkey, and Robin will show you some tricks & techniques, both historical and innovative! Visit the Showlist or the Links pages to see if there are any Workshops coming up. 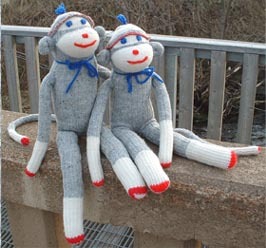 If you have anything to add to the history, or have any Sock Monkey Stories of your own to tell, please write to us! Our goal is to have the most complete history, and to share the wonderfulness of Sock Monkeys & their Friends!